Based on the hit 2000 British drama about a 12-year-old boy from a small North-Eastern England town who dreams of becoming a professional dancer, “The La Mirada Theatre For The Performing Arts” and McCoy-Rigby Entertainment in La Mirada, California continue their winning 2014-2015 season by presenting the Southern California regional premiere of the ten-time Tony Award-winning “Billy Elliot—The Musical”! Set in 1984 amid an increasingly bitter miners’ strike, young Billy discovers that he prefers the girls’ ballet class at the local community center to the boxing he’s actually been sent there for. After witnessing his remarkable ability on the dance floor, his teacher swiftly realizes that this boy has true potential, but no-one, let alone his conservative working-class family, is likely to tolerate a ‘bloke’ who dances! Directed by Brian Kite with plenty of intricate, jaw-dropping ‘uber-choreography’ by Dana Solimando, the production is graced with a top-flight score comprised of music by Elton John, and lyrics and book by Lee Hall (who adapted it from his screenplay.) “Sir Elton’s” music hearkens back to the best of his earlier ‘hit maker’ period of the mid-1970’s, when he literally ruled the pop-charts with one iconic hit after another. While occasionally interspersing some salty language, Hall’s book too, is exceptionally witty and Director Kite makes the most of these comic elements, which eases the show’s heavier or even slightly more ‘controversial’ components (such as pre-teen cross-dressing.) Take for example, the enterprising way the action of the striking workers clashing with riot-gear clad police is transposed in contrast to the lighter, more innocent workings of the Ballet studio, as Billy (at first awkwardly, but soon adeptly) learns his craft. 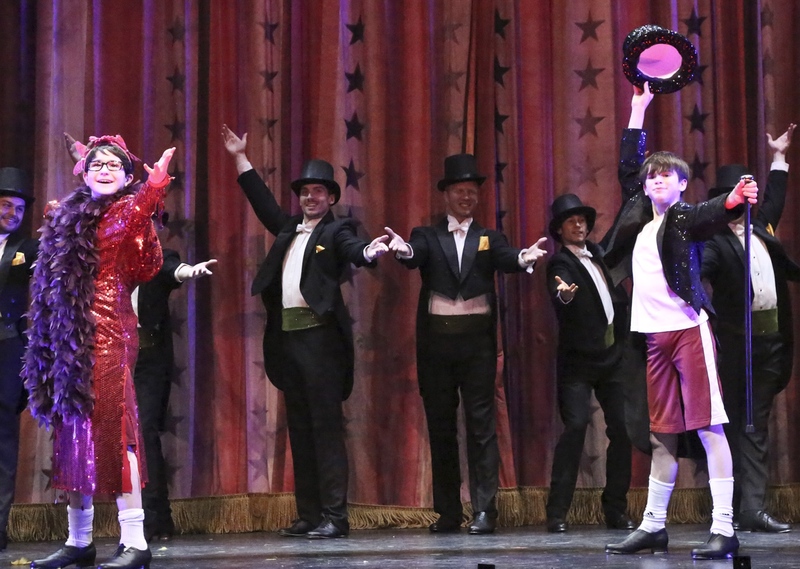 Even the moment when Billy discovers that his buddy “Michael” has taken to dressing in his sister’s clothes is handled with sensitivity and playfulness rather than as something shocking or off-color, and even gives rise to a lively number “Expressing Yourself”—which itself erupts into a sensational ‘tap-line’ so vibrant you can’t help but cheer at it’s conclusion. Solimando’s indispensable contributions include plenty of eye-popping instances of ballet, tap, swing, and even some Irish ‘clog dancing’ reminiscent of “The Lord Of The Dance”. 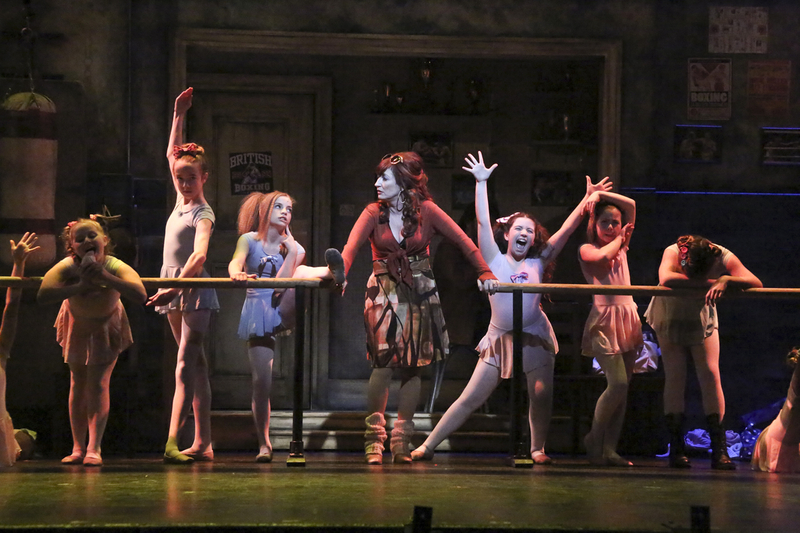 This is a certifiable ‘dance heavy” show wherein the dance and movement must absolutely amaze and, gladly in this regard, Ms. Solimando and the cast more than rise to the requirement. Foregoing a traditional overture in favor of a short film setting up the historical and political framework against which the story will be played, the opening, “The Stars Look Down” offers the ensemble a terrific chance for some great group harmony as the miners take center stage to sing of their plight, commitment to their cause, and hopes for better days. Act Two kicks off with lots of laughs and another sterling collective effort, as the striking miners perform “Merry Christmas Maggie Thatcher” as part of their union’s annual holiday show, which features a chorus-line of little masked “Margaret Thatchers”. Toward the end, an extended combination “finale/curtain call”, affords one more Gold-Medal showcase for “Billy” and the young ladies of the company as they delight with a snazzy, unexpected, ‘line-dance’ that promptly brought the auditorium full of ‘First-Nighters’ to their feet! Earlier that evening, Producer Tom McCoy took a minute before the show got underway to inform those in attendance that on the previous Saturday, the lad who was set to play “Billy” was rehearsing his big climactic number, when he was injured, thus requiring a quick replacement. As extraordinary fortune would have it though, with only five days left before opening, just such a replacement was found. 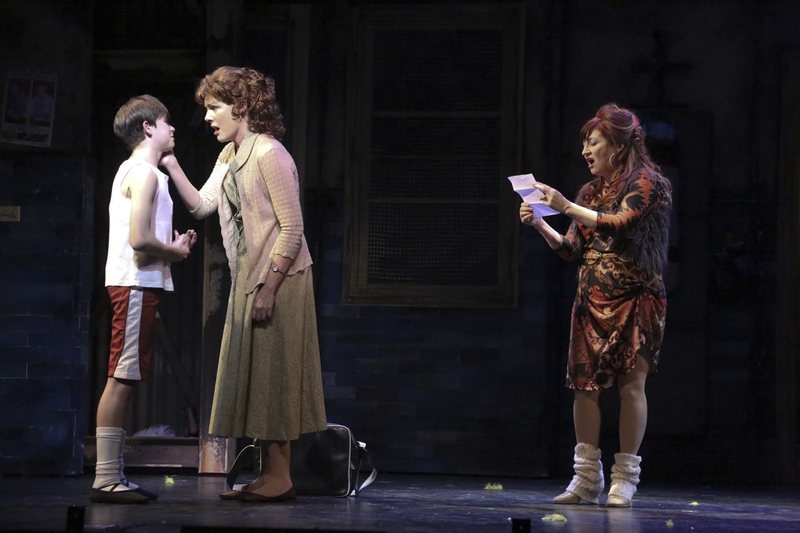 Understanding this–and seeing what a truly roof-raising performance was given on opening night, turns this already memorable evening of theater into a down-right phenomenal one! That ‘last minute’ replacement is a young ‘Super-Trooper’ by the name of Mitchell Tobin who had been part of the second national tour of the show, and to say his performance here in the title role is astounding would be a complete understatement! What wouldn’t be though, is to assert that he gives one of the very best performances Southern California has experienced in the last few years—at least! Add to it how his character is on stage throughout 90% of the goings-on, it becomes even more considerable a feat. His brief ‘shadow dance’ early on tenders a glimpse into still more outstanding things to arrive; and arrive they certainly do. It’s apparent even as he ‘burlesques’ learning those first couple of unsure moves that this kid is one hell of a talent! 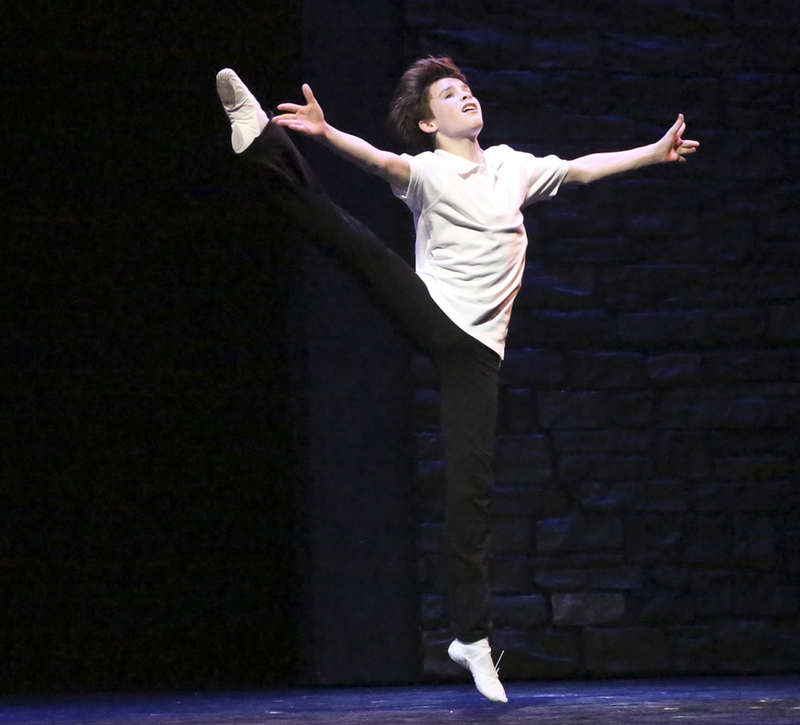 Indeed, Tobin manages to keep topping himself in each successive number–whether it’s Billy’s Act One “Angry Dance” closer (when circumstances dictate that he must miss his big audition for the “Royal Ballet School” causing him to ‘act out’ his frustration), his second act “Dream Ballet” staged as a breath-taking Pas-de-Deux between Tobin and Billy’s ‘older self” (pristinely executed by Brandon Forrest), or his eleventh hour dazzler “Electricity”. In fact, on opening night, this latter interlude effectively “stopped the show” as the eager spectators kept plying forth ovation after much-deserved ovation! “We will go down–but rise again! 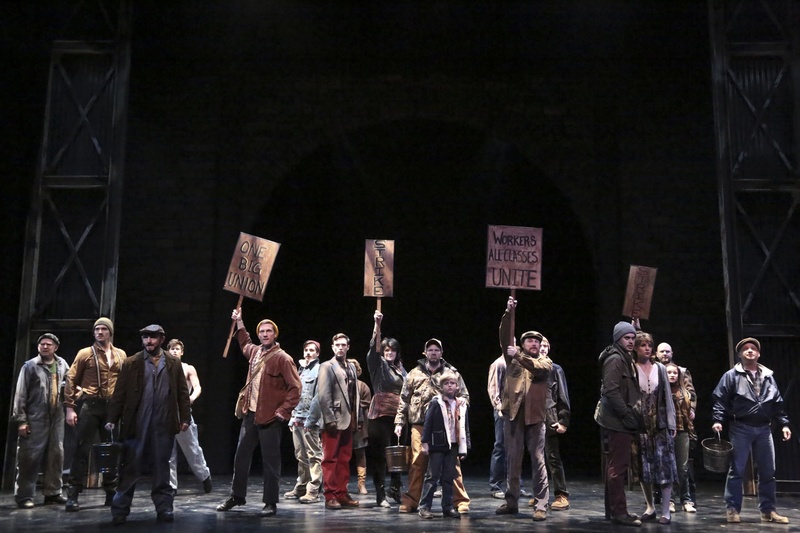 And we will all go together when we go…” The Town’s Striking Miners Sing. 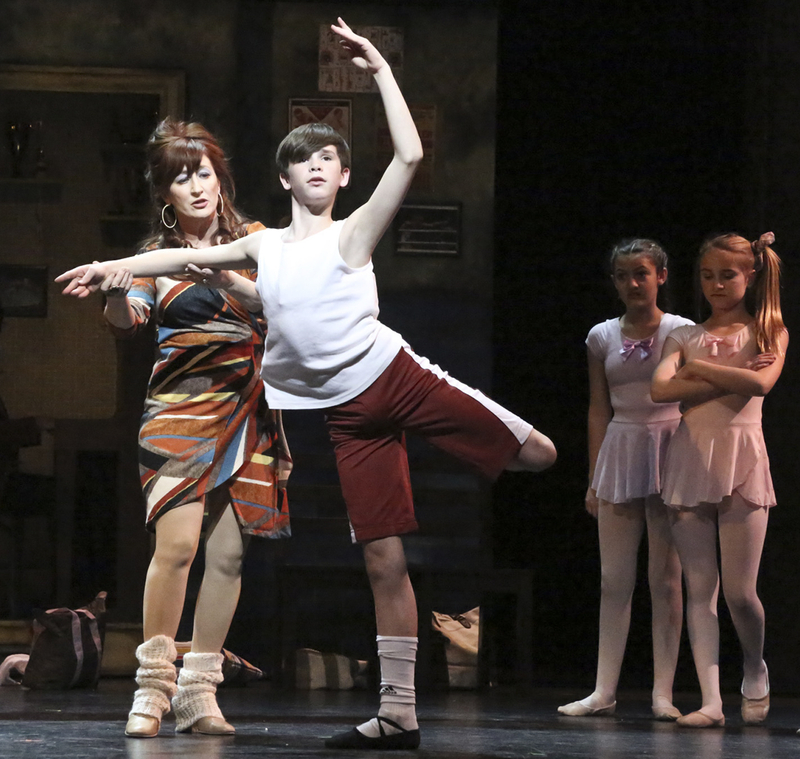 Joining him is Vicki Lewis who likewise doesn’t put a foot wrong as Billy’s sympathetic Ballet Teacher, “Mrs. Wilkinson”. Her introductory salvo, “All You Have To Do Is Shine” is A-Plus—backed by a chorus of little Ballerinas in neon tutus (providing yet another dynamic sampling of Ms. Solimando’s really ripping Choreography!) Here, Lewis gives the boy the basics urging him: “It doesn’t matter if you’re large or small, ‘trapezoid’, or short or tall; even if you can’t dance—at all! All you really have to do is ‘shine’!” It’s also no surprise that this number earns the first humongous round of applause in an evening filled to the brim with them. David Atkinson similarly does an impressive job as Billy’s widowed father, “Jackie Elliot”. Excellent support is also furnished by Marsha Waterbury as Billy’s Grandmother. Gram’s mind, we learn, isn’t what it used to be, but the one memory she can still savor after thirty years of enduring a less-than-blissful marriage, is how she and her late husband would go out dancing. This inspires one of the more touching refrains, aptly titled “Grandma’s Song”, during which we learn that Billy may even have dancing in his blood! 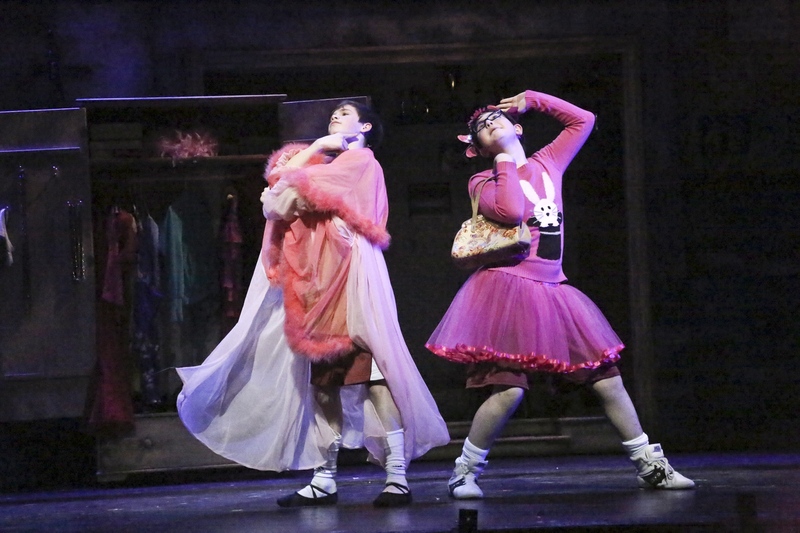 Furthermore, young Sammy Gayer as Mrs. Wilkinson’s daughter “Debbie” gets all the best laugh lines and she definitely makes the most of them, as does Jake Kitchin when he gets to ‘strut his stuff’ as Billy’s gender-bending school-friend, “Michael”. Production Stills By Michael Lamont, Courtesy Of David Elzer At Demand PR (www.demandpr.com) McCoy-Rigby Entertainment And “The La Mirada Theatre For The Performing Arts”; Special Thanks To David Elzer, Tom McCoy, Cathy Rigby, And To The Cast & Crew Of McCoy-Rigby Entertainment & “The La Mirada Theatre For The Performing Arts” Production Of “Billy Elliot-The Musical” For Making This Story Possible. 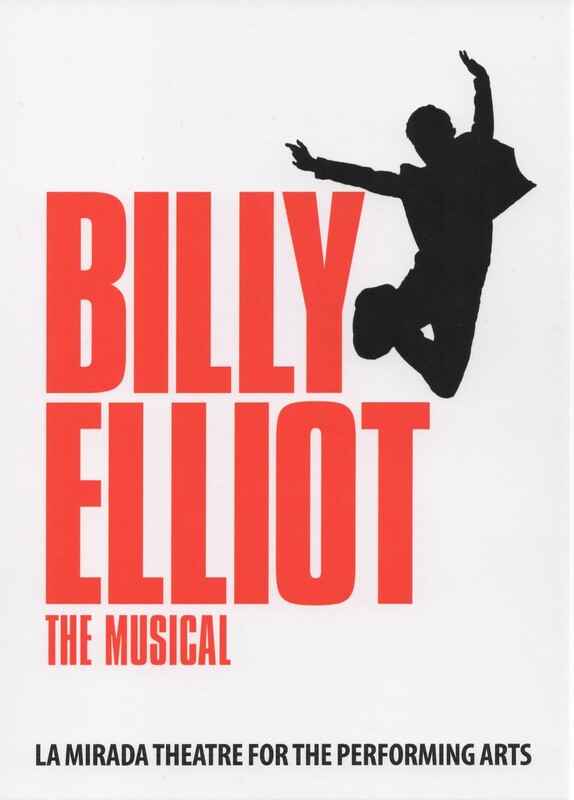 This entry was posted in Theater reviews and tagged "Billy Elliot The Musical", 2009 Tony Award Winning Musical, 2015 Southern California Theater Season, Brian Kite, Dana Solimando, Elton John, Hit Film Musical Adaptations, La Mirada Ca., La Mirada California, La Mirada Theatre For The Performing Arts, Lee Hall, McCoy-Rigby Entertainment, Tony Award Winning Musicals, Vicki Lewis. Bookmark the permalink. This is a very comprehensive and insightful review of the show at the La Mirada. My congratulations! Just a note about the phenomenon that is Mitchell Tobin. 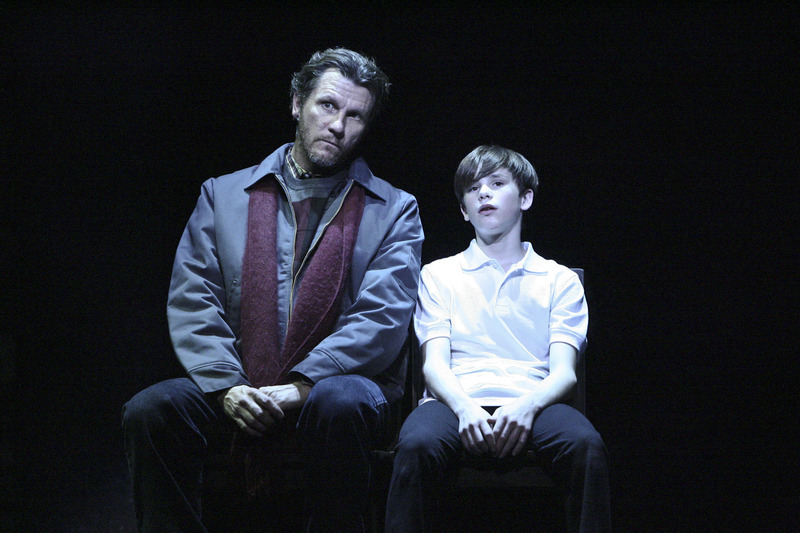 His outstanding talent being noticed during his stint with the North American tour of the show, his most recent run with BETM was in London, where he starred in the role for over 60 performances.